Posted on Thu, Mar 15, 2012 : 7:47 a.m. Haul out the sunscreen and picnic basket. The recent string of unseasonably warm days in the Ann Arbor area is expected to continue through next week. Wednesday’s high of 76 degrees broke the record high set in Ann Arbor in 1990, said University of Michigan weather observer Dennis Kahlbaum. The high that day was 75. The next few days should offer plenty of opportunity for practicing guitar or doing just about anything else outside. 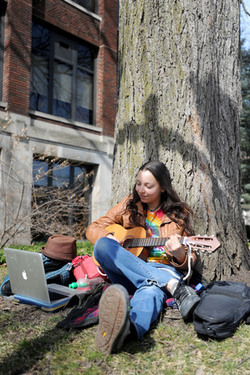 Here, University of Michigan School of Art and Design sophomore Elise Beckman practices on a recent warm day. If you do plan a picnic, you might want to schedule it for Friday or Saturday. Thunderstorms are possible Thursday and Sunday, but otherwise the forecast looks pretty good through Wednesday of next week, with highs near or above 70 each day. The Ann Arbor area will flirt with record high temperatures for the next several days. Thursday’s high is expected to reach 73 under partly sunny skies. The record for the date is 76, set in 1990. There’s a chance of thunderstorms and even the possibility of hail up to an inch in diameter, the National Weather Service said. Fog is expected to move in Thursday night. After the fog clears, expect a partly sunny day Friday with a high of 70. That temperature would tie the record set in 1977. Saturday promises to be partly sunny with a high of 72. That would also tie the record for that date, set in 2003. Showers and thunderstorms are again possible Saturday night. Sunday will be a little cooler with partly cloudy skies and a 70 percent chance of thunderstorms. The high is expected to be 68. Monday, Tuesday and Wednesday are expected to be mostly sunny with highs in the low 70s. The unseasonably warm weather earlier this week prompted Ann Arbor officials to close the Buhr Park ice rink three weeks early and open Huron Hills golf course about a week early. The reason for all this warmth? “The upper level jet stream pattern is set up so that the cooler more stormy weather is going to be in the Western United States,” said Dave Gurney, a meteorologist with the National Weather Service in White Lake Township. That allows warm air from the south to flow into southeast Michigan. Thank you, Jet Stream. We’ll take it. Fri, Mar 16, 2012 : 11:11 a.m.
Fri, Mar 16, 2012 : 3:22 a.m. This was a very unusual winter. I didn't shovel once. I am also confused why many of my comments have been labeled abuse when there is no abuse so I thought I'd check it out with this benign comment to see what happens. Thu, Mar 15, 2012 : 8:03 p.m.
On my car drive home from school this afternoon, my car dashboard reflected an outside temp of 77 degrees in NE Ann Arbor. Assuming a correct reading, we should read about another record being broken. Thu, Mar 15, 2012 : 12:52 p.m. Weather experts: does this mean that the warmth is here to stay? Maybe not record breaking, but should I break out the grass seed and gardening tools early, or wait until mid-May like usual? Thu, Mar 15, 2012 : 3:53 p.m. I have already started the long dreaded mess of clean up already. They won't start picking up the mess until mid April. I do plan to start looking at plants in a few weeks. I hate to say it, but we are done with winter and winter is done with us. Going to be a hot summer. Thu, Mar 15, 2012 : 12:20 p.m.
5 mosquito bites yesterday - totally worth it. I'd take 20 for this kind of weather. Thu, Mar 15, 2012 : 3:52 p.m.
With the weather the way it is this year? We are going to need mosquito netting around our gazebo to keep the buggers out of everything. Going to be a bad summer of bugs. I can just feel em biting me now.